Broward Sheriff Gregory Tony implemented a change during magistrate hearings in court after a suspect punched a public defender. NBC 6's Laura Rodriguez reports. 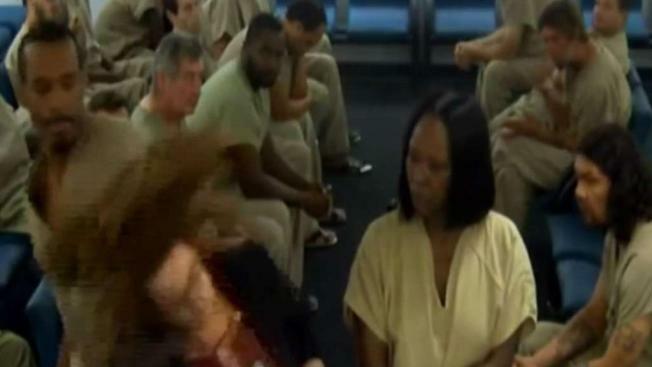 A Florida public defender was blindsided by a punch thrown by a defendant during an incident that was caught on camera in Broward County bond court. The Wednesday morning attack happened as Broward Judge Jackie Powell and attorneys were in the middle of a bond hearing for another inmate. Assistant Public Defender Julie Chase was standing next to a female defendant at a podium when a man waiting for his own bond hearing stood up, walked behind Chase and punched her with his left hand. The courtroom video shows Chase fall to the floor. The inmate standing next to her put her hands to her mouth and backed away. Deputies quickly moved in, handcuffed the man and carried him from the courtroom. He was later identified as 27-year-old William Green, who was arrested on a battery charge on Tuesday, according to jail records. Green is now facing additional battery charges after the incident, according to BSO. An arrest report said Green was accused of hitting an employee at a mental health facility. Broward's chief assistant public defender, Gordon Weekes, said BSO should have done more to identify that Green has a mental illness and failed to secure the safety of the attorney and others at the jail. "I am utterly outraged at the jail's failure to secure that facility and to make a better decision on how they deal with folks suffering from mental illness, Weekes said. Broward Sheriff Gregory Tony called the incident "troubling" and that all inmates will be handcuffed during magistrate hearings "effective immediately." "I learned that over the last several years, BSO has received numerous requests from the Public Defender’s Office asking for a more lax approach to our security procedures during magistrate hearings," Tony said in a statement. "Although I understand their concern that having deputies standing close to the inmates or having them wear handcuffs or shackles could imply guilt, they must in turn understand that their requests made it possible for this unusual situation to occur." Chase was taken to the hospital, but her condition was unknown.